Doctors have a new way of thinking about how to treat heart and skeletal muscle diseases. Body builders have a new way of thinking about how they maximize their power. Both owe their new insight to high-energy X-rays, a moth and cloud computing. 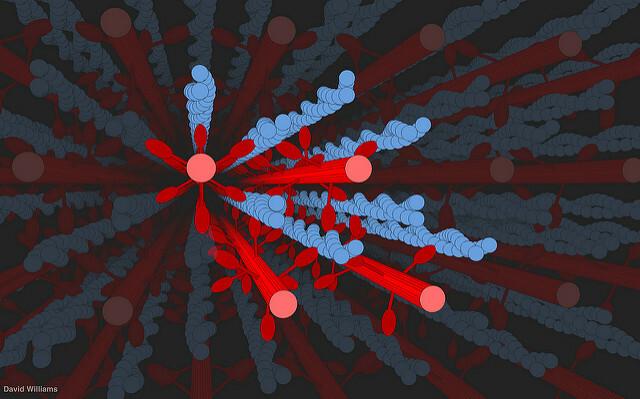 C. David Williams created a 3-D computer model of filaments of myosin (in red) reaching out and tugging along filaments of actin (in blue, looking like stands of pearls twined together) during the contraction of a muscle. The model allowed researchers to consider the geometry and physics at work on the filaments when a muscle bulges. Credit: D. Williams/University of Washington. LEMONT, Ill. – The understanding of how muscles get their power has been greatly expanded with new results published online July 10 in the Royal Society journal Proceedings of the Royal Society B. The Royal Society is the U.K.‘s national academy of sciences. The basics of how a muscle generates power remain the same: Filaments of myosin tugging on filaments of actin shorten, or contract, the muscle – but the power doesn’t just come from what’s happening straight up and down the length of the muscle, as has been assumed for 50 years. Instead, University of Washington-led research shows that as muscles bulge, the filaments are drawn apart from each other, the myosin tugs at sharper angles over greater distances, and it’s that action that deserves credit for half the change in muscle force scientists have been measuring. Researchers made this discovery when using computer modeling to test the geometry and physics of the 50-year-old understanding of how muscles work. The computer results of the force trends were validated through X-ray diffraction experiments on moth flight muscle, which is very similar to human cardiac muscle. The X-ray work was led by co-author Thomas Irving, an Illinois Institute of Technology professor and director of the Biophysics Collaborative Access Team (Bio-CAT) beamline at the Advanced Photon Source, which is housed at the U.S. Department of Energy’s Argonne National Laboratory. C. David Williams with an X-ray diffraction apparatus used to measure lattice spacing of filaments in moth wing muscle samples. Credit: A. Kidder/University of Washington. A previous lack of readily available access to computational power and X-ray diffraction facilities are two reasons that this is the first time these findings have been documented, speculated lead-author C. David Williams, who earned his doctorate at the UW while conducting the research, and now is a postdoctoral researcher at Harvard University. Currently, X-ray lightsources have a waiting list of about three researchers for every one active experiment. The APS is undergoing an upgrade that will greatly increase access and research power and expedite data collection. The new understanding of muscle dynamics derived from this study has implications for the research and use of all muscles, including organs. This study gives scientists and doctors a new basis for interpreting experiments and understanding the mechanisms that regulate muscle contraction. Researchers have known for sometime that the muscle filament lattice spacing changes over the length-tension curve, but its importance in generating the steep length dependence of force has not been previously demonstrated. “The predominant thinking of the last 50 years is that 100 percent of the muscle force comes from changes as muscles shorten and myosin and actin filaments overlap. But when we isolated the effects of filament overlap we only got about half the change in force that physiologists know muscles are capable of producing,” Williams said. The rest of the force, he said, should be credited to the lattice work of filaments as it expands outward in bulging muscle – whether in a body builder’s buff biceps or the calves of a sinewy marathon runner. “One of the major discoveries that David Williams brought to light is that force is generated in multiple directions, not just along the long axis of muscle as everyone thinks, but also in the radial direction,” said Thomas Daniel, UW professor of biology and co-author on the paper. “This aspect of muscle force generation has flown under the radar for decades and is now becoming a critical feature of our understanding of normal and pathological aspects of muscle,” Daniel added. Since the 1950s scientists have had a formula – the so-called length-tension curve – that accurately describes the force a muscle exerts at all points from fully outstretched, when every weight lifter knows there is little strength, to the middle points that display the greatest force, to the completely shortened muscle when, again, strength is minimized. Williams developed computer models to consider the geometry and physics at work on the filaments at all those points. “The ability to model in three dimensions and separate the effects of changes in lattice spacing from changes in muscle length wouldn’t even have been possible without the advent of cloud computing in the last 10 years, because it takes ridiculous amounts of computational resources,” Williams said. The work was supported with funding by the National Institutes of Health and National Science Foundation and with cloud computer access provided by an Amazon​.com grant for research. Use of the APS X-ray facility is funded by the U.S. Department of Energy’s Office of Science. 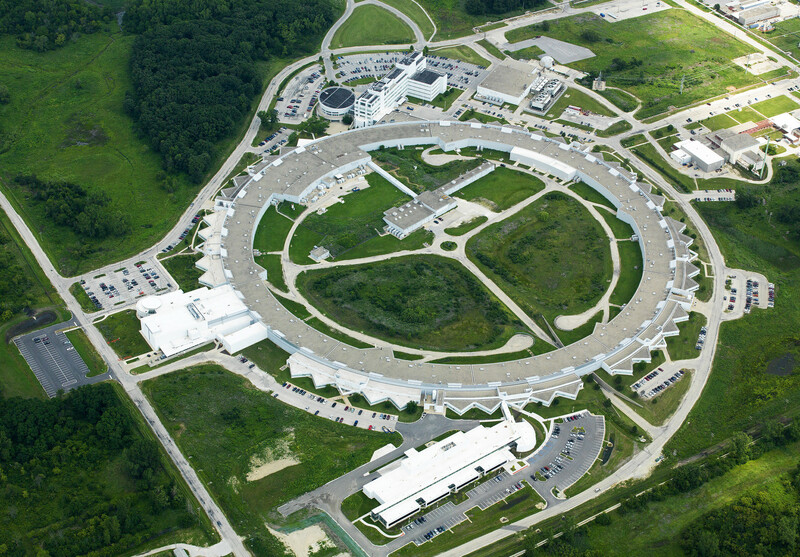 The Advanced Photon Source at Argonne National Laboratory is one of five national synchrotron radiation light sources supported by the U.S. Department of Energy’s Office of Science to carry out applied and basic research to understand, predict, and ultimately control matter and energy at the electronic, atomic, and molecular levels, provide the foundations for new energy technologies, and support DOE missions in energy, environment, and national security. To learn more about the Office of Science X-ray user facilities, visit the Office of Science website. Moth muscle is similar to human heart muscle.